Do you think about leading excellence? You likely have a drive for excellence. You certainly want your team to do their work with excellence too. I wanted to create an episode about leading excellence. There is one brand in the world that I think of when it comes to EXCELLENCE. It is a hotel chain that is widely known for it. It is Ritz-Carlton Hotels. I have with me Horst Schultze who is a co-founder of Ritz-Carlton. He is also the author of Excellence Wins. We talk about how to inspire your people and the importance of leading excellence. Gene Hammett: Hi, this is Gene Hammett. I am the host of leaders in the trenches. My question for you today is how do you inspire your employees to have excellent. Why would you want them to have excellence? Because excellence is exactly what you need to separate yourself from the competition to create something that aligns people together. 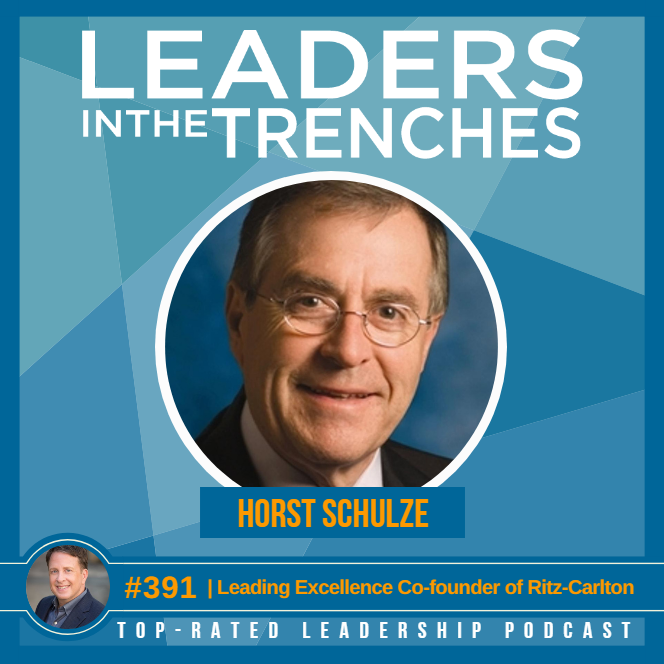 Now, I’m not going to go too much into this because I’ve got an excellent guest today and I want you to really get the full effect of it, but I have Horst Schultze say, uh, he’s the co-founder of Ritz-Carlton and he wrote this book, excellence wins. We talk about the reason why excellence was the backbone of that Ritz-Carlton brand. We talk about how to engage employees and create leadership that inspires people to want to be excellent at work and treat others with excellence. So stay tuned to this full interview on leaders and the trenches. Gene Hammett: Hi Horst, How are you? Horst Schultze: I’m fine. How are you? Gene Hammett: I am great. I’m excited to have you on the show. This is leaders in the trenches. I’ve already let our audience know a little bit about you, but I’d love for them to hear it from your voice. So tell us a little bit about you and your journey to where you are today. Gene Hammett: Tell us a little bit about you. Horst Schultze: I’m on me. Well, I’m, I’m a hotel, a hotel guy who started us working as a busboy when I was 14 years old and we have a home, grew up in Europe, broken in Germany, Switzerland, hold on, Honda America, like France, England. And then in 1964 came to the US, worked for Hilton Hyatt and eventually started a Ritz-Carlton Hotel Company. And after nearly 20 years running that company, I started another company which was called Capella Hotels, which was sold to nearly two years ago. I’m still involved somewhat as a chairman emeritus, you know her dad is a retired chairman, but I’m very busy now making speeches, consulting, et cetera. That’s who I am. Gene Hammett: Well I appreciate you giving us that. You know, it came over my email to be on the show, founder of Ritz Carlson. It was like Ah, that would be an interesting conversation because the name and the brand of Ritz-Carlton are known for Excellence in customer service. I’m sure that’s intentional. So where did that come from? Horst Schultze: The name we are talking? Gene Hammett: Just excellence in customer service. Horst Schultze: Something’s consonant sound. Well, and I also said I was all my life and Maltin customer service has stopped him and I was 14 and the first maitre d that I broke, but the first manager of the food and beverage operation and the hotel they I’ve worked with, in fact, the first time he talked to me, he said, let’s understand we don’t come to work here. We come to this place to create excellently. And I was said that was the, of course, I was 14 years old. That made a lot of impressions yet most of the carbon at the same time. So, but it, but at the same time, it lives with me. Why go to work to just fulfill the function. We might not go to work to create something excellent the same time, the same effort, not more, just a different mindset. Creating excellent. Rather than just fulfilling a function so the function will eventually become better and it is more fun and it’s creative and it’s fulfilling. For a human being. Excellent is it’s, I think of us extremely important for us. Otherwise, we just float through life rather than create. Gene Hammett: Well, one of the things I like about this, I haven’t read the whole book yet, but you wrote a book about this and you told a story about an aeronautics company where an employee was going to show them the ropes. Gene Hammett: And it comes in and says, I’m going to show you how to survive through each day and get through it. Horst Schultze: Yeah. He mentioned that when that’s happening all around us and on whose fault is it? It’s leadership. Horst Schultze: She had has created that environment where people come to work and really just want to spend a time Monday, get over the time. We got to get over the eight hours and get back home because they’re not connected to anything. The American without being connected to the outcome of the work and pick that. The millennials today, that’s what they say. They say, we didn’t say it, but we were thinking and the millennials say, what’s in it for me? What is the outcome here? I’m just doing something for you. Or are we connected together? It’s kind of a sad state of our leadership in businesses and of course, we invite them to come to work or we hired them in not inviting them. We hire people to fulfill a certain function rather than hiring them to be part of our dreams. Part of our objectives, because let’s face it, you and I to the chest is sitting in. It’s fulfilling a function. Horst Schultze: If you’re talking about human beings, which we now hire to bring in to fulfill a function and they have no connection, no emotion to it. So they, all they want is to get over those eight hours every day too but Gaga gets home and then we have great expectations from them. It’s kind of ridiculous, isn’t it? Gene Hammett: It is. It is. And I appreciate you going into that because you know, you created a vision, right? With this hotel called Ritz-Carlton and excellence being something that probably is near and dear to you. That’s one reason why your book has excellence wins. Why did you have to write this book? Horst Schultze: Well, I yeah, I had to, well, you know, the, you come to a certain age, suddenly you Korea and all the eagle stuff’s gone and you want to give something back. That was part of it. But interesting enough and Stephen Covey years ago started urging me and calling me once a year at least have you read me a book? You have to share your thinking. You are obligated, morally obligated. Wow. Yeah. Yeah. And in fact you said, I want to write the forward and unfortunately, it didn’t do it. And the meantime, Stephen Covey is going on and then he has passed away and I’m sadly a crit mind left us. But he pushed me and he told me there is a responsibility to share the meaning on what it meant to be successful is there’s a responsibility to give that to others. And as I went on and an hour in mind that don’t what’s on mine of that in my mind and then I mix a lot of speeches through the speakers bureau, do wash, spears, parole and every time I make a speech people come to me and saying, you have a book and every time they reminded me of Covey’s urging that you have to share your knowledge when you have some and that’s why I wrote it. ADVERTISEMENT: Before we jump into the content, let me just remind you that today’s podcast is brought to you by Audible. 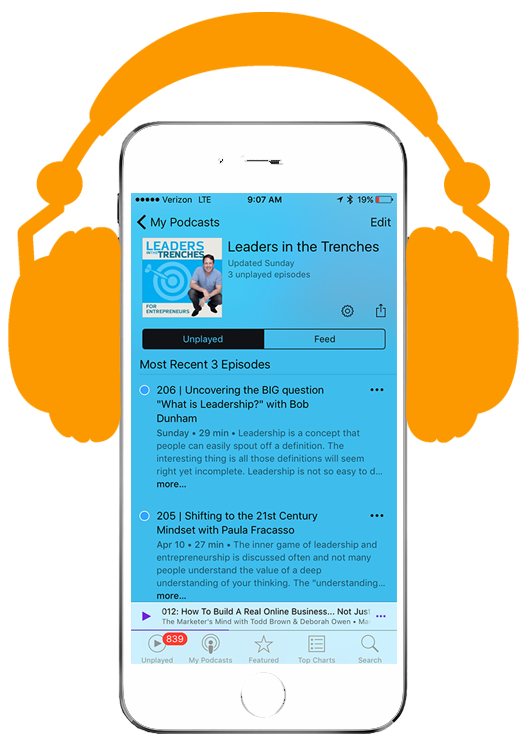 If you like to listen to podcasts, you probably liked to listen to audible books and I want to give you a free 30-day trial and all you have to do is use this URL which is audibletrial.com/leadersinthetrenches. That’s the name of the podcast. Just go there. You can buy any book you want and love for you to buy the trap of success. That’s my book that came out earlier this past year. And if you want to get a 30-day trial, just go to audibletrial.com/leadersinthetrenches and back to the show. Gene Hammett: Well Horse, let me ask you, let’s go a little deeper in there. But why about excellence? Horst Schultze: Because it is excellent is something that Paul Fields people excellent is ambition on everybody should have and we have, you know, even the Bible says we perish without vision and see so much around me that people were work without vision and excellence is to connect to a vision. It’s not the doing excellent connects it to a vision and excellence demands from you that you have a vision again, otherwise you just spoke in the function today. If it’s excellence and actually leads to something so it’s higher and it doesn’t cost more, but it is fulfilling is, hey, Aristotle, 3000 years ago said people will not be fulfilled unless they have purpose and belonging. And if you put that together, how would you have said, how do you have a sense of purpose? How do you pursue purpose by creating excellence? So excellence is a, is a very important issue for me and the, and of course it leaves with me ever since my 14 years, my first made these said, don’t come to work, to work, come to work, to be excellent, to create excellence. I added to it. To me, I always went to work to create excellence and to be with my friends. That means everybody I’ve worked with, if they liked it or not, they’re my friends. Gene Hammett: I want to ask you a question, Horst. I’ve got these little stickers that I, I give speeches too. I tell the audience that I love Mondays. Gene Hammett: You go back to see your friends. But if you feel fulfilled in the work that you’re doing, you love Mondays. But how many people do we know that are looking for, you know, to get over a Hump Day or two, you know, thank God it’s Friday and that’s not the work environment that I leaders should be creating. Would you agree? Horst Schultze: Well done. One that’s created by Lena, so who met again, I have to come back to it. Forgive me, that’s a bit repetition here because they go to work to fulfill a function. Who cares about the WHO, who goes to work to clean dish in my business to most dishes, to make rooms to check people in and all that that we do. That should not be the reason to go, that that is only a function that takes us to another place which and that knew that place is the vision guilty organization. And if I don’t connect my all my employees to that vision, we are not going to get there, number one. And number two, I am treating them like a machine, like a chair. Just that put once a function rather than inviting them to be part of a team. Part of creating something in that creating can only be accomplished door. If the division is excellent, then you only can accomplish it with excellence. Gene Hammett: So what do you tell leaders that are looking to grow a company that has built the brand that Ritz has beyond vision? What are the some of the other elements that are necessary for a strong culture like you guys created? Horst Schultze: Monday? Of course, their leaders and their managers and they’re very, there are many managers who still make the organization successful, but the leader is a moral leader who aligns the employees, aligns the organization who were behind the vision of the, of the organization. That’s called alignment. Today Minaj has an, everybody talks about alignment, but it’s just a slogan. Word alignment. Alignment is simply if everybody knows, including the last employee knows what is the objective as a company, what’s the motive of that company? How do I benefit from that? Modi, everybody knows that and everybody, every employee knows what is the expectations of our customers. Now I’m an aligned organization. Leaders make sure that exists. Managers just force things to happen. That doesn’t mean they’re not successful and they’re friendly. They’re not very moral. Gene Hammett: I want to go into something that’s inside this book service standards. You had 24 service standards, is that right? Gene Hammett: How did you, what our service standards and how did you use them to reinforce this alignment across, you know, the thousands of employees that you had. Horst Schultze: This is a key element to run an organization. This is the key commission. The first of all, how did we do? We developed them. I made a decision, Vanessa hundreds of cotton led. I Would Capella, I’m going to create the finest brand and Navarro. That’s a decision. That’s a dream. That’s an objective. That’s the vision. Now I had to decide what will it take to make me superior to competition so that I will be the leader in the world. So we did. We developed 24 points, which we knew if we do those 24 things superior to the competition, we will be seen by our customer as superior to the competition. That’s how we develop them. Now how do we implement them is we share those thoughts, those for 25 points. The first day an employee comes to work. We first tell the employer our belief system, who we are, what’s our dream? Horst Schultze: What’s our thinking? What’s our soul as an organization inviting them to join and then we teach those 24 points because they’re so essential. They should be taught the first day at work. Then in order to sustain those 25 points every day, we will repeat one of those points to every employee before every shift. Manu, with 24-hour business, we would be, we don’t have a key to the hotel. The money powers every shift. You cannot go to work, not in the corporate office either without herring, one of those 24 points from the day today. It may be point number 11 which is shared in every old town to every department, to every employee’s before they go to Burke. [inaudible] number 11 says, if you get a complaint, you own it and you empowered to take care and make sure that this customer who is complaining is going to be loyal after you’re finished with it. That’s being taught today. Again, that’s being explained today. That means if you’re the way that and the guest complaints about his tv change and not working, you own the TV change and you can say, please forgive me. I will buy you breakfast. That’s empowerment, is he? The empowerment goes with it. There’s another bus burned out. Empowerment. Nobody knows really what it is. Yeah. Gene Hammett: I wanted to ask you those things because I think a lot of companies struggle with having values but not aligning the behaviors and the service standards really are the behaviors we live through the brand. I want to wrap this up with one thing, horst. You know you talked about leadership. What is the key message that you think are leaders today need to really grasp the most that they seem to be missing? Horst Schultze: Well, clearly we touched on that very strongly here. Clearly have a clearly defined vision, not a mission. People misunderstand vision and mission and mess it up all the time. A mission is not where you, our mission is what you do today. A mission is where it will take you. Who are you in 10 years from now? What is your organization? And once you established a clear, the Cya, what a company will be done, you have to question yourself and that’s the key. Is this dream? Is this objective good for all concerned? The investor, clearly customer, clearly the employee and society one set is totally clear that it is good for all concerns. Now you delete. I have no more of the rights to compromise it for yourself, not for anyone else because you have determined unquestionably the objective of the company is good for all concerned. From there on, that’s what you lead to. That’s where it takes the people too because then you know cannot make compromises not for yourself because he would go against all others. No for anyone else, no. For any situation, you’re not compromising. Gene Hammett: You’ll move forward for all concerned. Well Horst, I really appreciate you being here on the podcast leaders in the trenches. I enjoy sharing some insights from this book. I really feel like you’ve nailed something here and I appreciate you being here on the show and short. Awesome. This is such a great interview. I love talking to people that have been there before or been in the trenches, growing mega brands to talk about something that you need to understand. I never know where these things go, but you know, someone once told me what the vision was important and I’ve heard it over and over and you’ve probably heard it over and over, but do you heard it again today from forced talking about how important vision is. Vision is something that aligns the people together and you must have that and you must reinforce it every day. Gene Hammett: You must create the service standards is what Ritz-Carlton does. I create behaviors. You must have people that understand the customer expectations and you must be the leader that can engage those people to think in new ways because that’s your job. Hopefully, you enjoy these interviews. Hopefully, you’re sharing them with someone that you think could benefit, but I enjoy bringing them to you. If I can do anything for you in what you are doing in growing your company, make sure you reach out. I the fastest growing company, the top 1% the Ink 5,000 of growth and they are growing so fast, it’s astronomical. But why I studied them is because I want to help you grow your company. So if you have any questions about growth and your leadership and the culture who align that, make sure you reach out. My name’s Gene Hammett and I’ll talk to you soon. As always lead with purpose. Today we talked about leading excellence with one of the iconic brands in hospitality. I am honored to share with you about this journey so you can lead excellence with your team.